About 100 celebrants dined on bananas or banana cake, and many had their pictures taken with a life-size cutout of Charles Darwin on Feb. 12, the 200th anniversary of the great scientist’s birth. The Darwin Day celebration included evolution-themed temporary tattoos; “pin the beak on the sparrow;” and a rousing chorus of “Happy Birthday, Dear Darwin” led by Colin Purrington, associate professor of biology, who organized the event. Why bananas and banana cake? “All primates love bananas,” Purrington says. 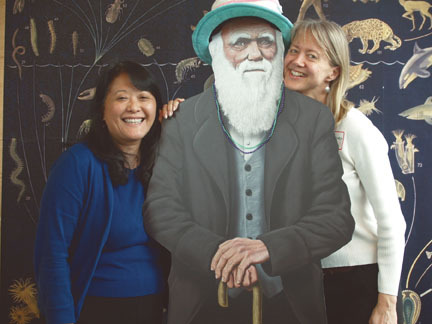 Showing some love for the father of evolutionary science are professors Amy Cheng Vollmer (left) and Sara Hiebert Burch ’79. WATCH: Highlights from Charles Darwin’s 200th birthday bash, organized by Associate Professor of Biology Colin Purrington. Watch highlights from Charles Darwin’s 200th birthday bash, organized by Associate Professor of Biology Colin Purrington.